Check out the latest selection of flirty designs in ethnic chic, tiered gypsy girl and gothic goddess styles. Daywear takes on a practical feel with pretty prints and subtle tie dyes in earth tones to soften the look. 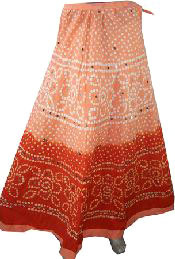 Lots of full skirts this season which come in luscious dip dyed fabrics, sparkly sequins, lacework and beautiful hand embroidery. 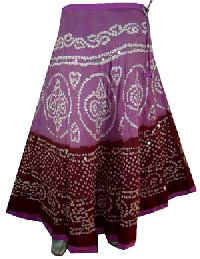 We use traditional Indian techniques to produce dramatic modern styles for girls & ladies - boys and men. We use tie dye embroidery, patchwork, sequin, mirrors, printed and plain. 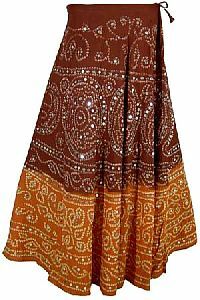 Product: Ethnic bandhni ( tie and dye )long skirt in cotton with sequence work and drawstring. 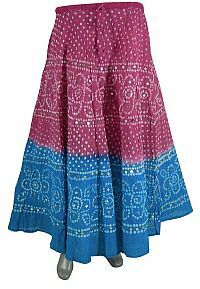 MORE DETAILS: Regularly made in beautiful tie and Dye colors and colors Full prints Skirts. 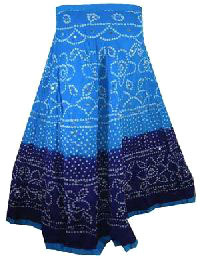 100% cotton Fabric with cotton. sequins Hand work as per the design.